Microsoft’s made no secret it wants to push the Xbox and PC platforms closer together, with Windows 10 acting as the glue cementing the two. That plan took a huge leap forward today, though: During Microsoft’s E3 2016 press conference, the company announced support for certain Xbox One games on the PC. No, not via streaming. They're actually coming to the PC. 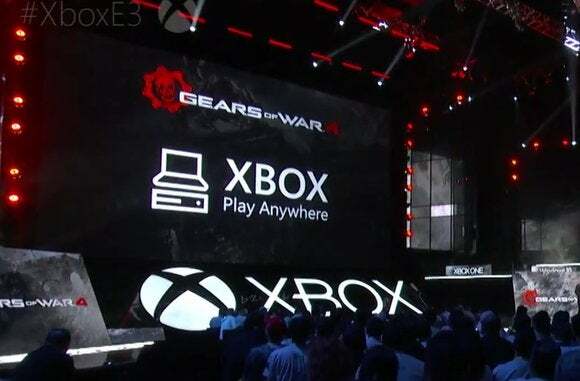 It’s called “Xbox Play Anywhere” (why not “PC Play Anywhere”?) and is similar to the cross-buy offer that allowed you to buy Quantum Break for Xbox One and get a copy for the PC. This capability is of course locked to the Windows Store, which is a shame. But the upside? Some games you purchase for the Xbox One will automatically populate cross-buy on the PC (and vice-versa). Installation is as easy as popping into the Windows Store and going to your Library tab, where you’ll find all your Play Anywhere games populated. Your saved games will also make the transition over from console to PC and back again, and players on both platforms will be able to play games together. Currently the program is mostly made up of Microsoft’s first-party titles, with a few smaller indies thrown in for good measure. But that’s still quite a crop of games, including Forza Horizon 3, ReCore, Gears of War 4, Scalebound, Sea of Thieves, and We Happy Few. Now the main question is whether the games will work properly. I love Quantum Break, but its PC port left quite a bit to be desired—as did Gears of War Ultimate Edition. Microsoft’s going to need to be a bit more stringent with its port certification if this whole cross-buy initiative is going to be a success.